Welcome to the 31 Day Challenge To Optimize Your Blog With Social Media. Today we’ll talk about how to optimize your blog with mission-critical social media plug-ins. The WordPress community consists of thousands of software developers who create free software for your blog, called plug-ins. There are hundreds of social media plug-ins, designed to display your Twitter friends, pull in your Delicious tags or even import comments on a Facebook Note back into the blog post. A word of caution with plug-ins. If you’re like me, you want to add the latest shiny plug-in to your blog. And before you know it, your blog looks like downtown Tokyo. You could drive away visitors who get blinded by an abundance of shiny objects. Too many plug-ins can cause performance issues on your site. The good news about plug-ins is that you can try them out for free, and deactivate them if you run into any problems. The important thing is to focus on your blog strategy and not the latest cool gadget. I used the term “mission critical” to point out several plug-ins that are important and why you should consider using them. 1TweetMeme – Guy Kawasaki loves this plug-in because it lets people easily “spread the word about your websites and blogs.” This plug-in also allows you to collect stats on how people are tweeting about your blog posts. Why mission critical? Because how people tweet about your content informs your content strategy. 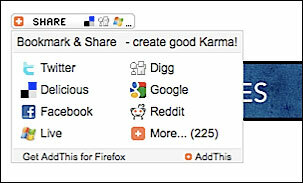 2AddThis – This lets folks bookmark your post on pretty much any social media site. This plug-in is critical to help you see how people share your content (which sites they’re sharing on and which posts are shared the most). Social Bookmarks, Sociable (100+ different social bookmarking sites), ShareThis, SexyBookmarks are also great bookmarking plug-ins, but don’t have the reporting that AddThis does. Why mission critical? Because you need to be active on the sites where your content is being shared. 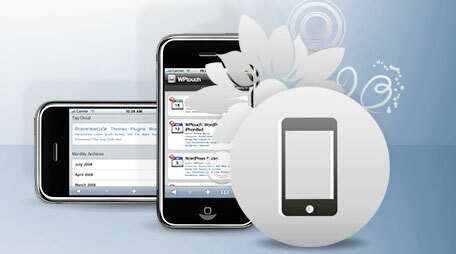 3WPtouch iPhone Theme – This plug-in turns your blog into an iPhone application-style theme when viewed from an iPhone, iPod touch, Android or BlackBerry touch mobile device. Why mission critical? Because more and more of your readers will be reading your blog on their smart phones. Below are a few other plug-ins I use to make my blog more social. 4Posterize – Sends an email to the Posterous blogging service that will link to your post. 5Shorten2Ping – Allows you to update status at Ping.fm or Twitter whenever a new blog entry is published. 6AWeber Integration – Provides a simple way to add one or more AWeber forms to your sidebar and optionally enable AWeber email Web analytics for your website. These are plug-ins that I’m using, but chances are I’m missing some good ones. What social media plugins are you using? Why? Please share in the comments. Finally, ask other bloggers you trust what plug-ins they use. And again, don’t be afraid to scale back the number of plug-ins you use. Discuss: What social media plug-ins are you using and why? If you don’t want to miss out on the 31 Day Challenge To Optimize Your Blog With Social Media, please sign up. John, I have a completely different list of must-have WordPress plug-ins that I'm trying to find time to publish. When I do, let's compare notes here! Excellent blog and very useful …help is appreciated. I really want to get my chubby paws on this! I can already feel my GPA going down until I finish the game! The plugins that you should get are the ones that give your readers the ability to share your content in their respective social media accounts. Your content has a higher chance of spreading out like wildfire if you have those kinds of plugins. Excellent post, not just the usual suspects, I have found a couple of useful additions to my toolbox.